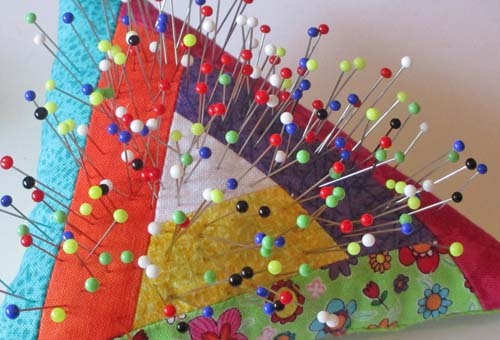 When I think back to the random collection of straight pins I had in my pincushion when I first started to sew… oh, my! Some “borrowed” from Mom’s pincushion, some taken from the collars of Dad’s new shirts, maybe even a few that I purchased in those flat paper packages. One thing most of them had in common was little metal heads, kind of like miniature nails. And most of them were short, thick, and kind of dull – I remember the heads pressing indentations in my fingertips whenever I laid out a pattern and pinned it to heavy fabric. Ouch. Many, many years later, when I started working at a local sewing store, I learned about glass-head pins. What a difference! 1) The sharp points and thin shafts (0.50 mm) push easily into fabric. 2) The round heads don’t hurt my fingers when I push them. 3) The thin shaft doesn’t distort the fabric and leave holes. 4) They come in pretty colors! 5) The glass heads don’t melt, so I can leave iron and press projects without removing the pins. 6) They’re long (1-1/2″), so they hold more fabric. 7) The colors can be used to indicate “start here” (green) or “don’t stitch past this point” (red). 9) The tiny box they come in can be recycled for small items like beads and buttons. 10) The brightly-colored heads are easy to see in folds of fabric and on the floor. Do you love my new pincushion? I do 🙂 I got it at the pincushion swap at the Greenville (SC) Modern Quilt Guild last weekend. Thank you, Marilyn! Now, there are other types of pins, too – flower head pins, silk pins, quilt pins, applique pins – and I use them, too. But glass head pins are the ones I use most. What sort of pins do you prefer? Previous Previous post: Need an Idea? Inspiration? Instruction? Visit Our Pinterest Boards! I love ’em too! I won’t use anything else. Just bought so e glass head quilting pins. Yes, the are sharp; stuck myself today.